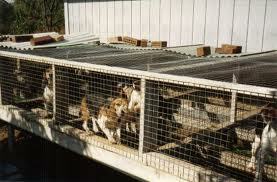 you support these sites, you’re supporting the puppy mill industry. website depicts dozens of photos of cute and cuddly, happy and healthy puppies. records of puppy mill dogs are often falsified. breeding at puppy mills is performed without consideration of genetic quality. This results in generations of dogs with unchecked hereditary defects. puppy mill dogs are often falsified. What Problems Are Common to Puppy Mill Dogs? How Are Animals Treated at Puppy Mills? their paws and legs—and it is not unusual for cages to be stacked up in columns. feel the sun or a gust of fresh air on their faces. How Often Are Dogs Bred in Puppy Mills? born with overt physical problems that make them unsalable to pet stores. When and Why Did Puppy Mills Begin? 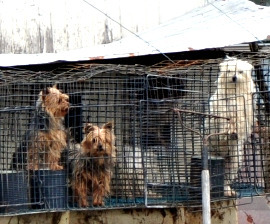 Missouri is considered the largest puppy mill state in the country. Amish farmers in the 1970s that puppies were the cash crop of the future. patronize the stores and websites that sell their dogs. Do not buy a puppy from a pet store—in fact, do not buy a puppy from any place that does not allow you to see its entire facility and meet the mother dog. This includes websites that sell pets online. Anyone can put up a great-looking website boasting the highest standards of breeding and care, but you really have no way of knowing if such businesses are what they claim. Truly responsible breeders want to meet you before selling you one of their prized pups to be sure that he or she is going to a good home.